To Get the Capital You Need To Start & Grow your Business. Need Seed Capital to Start Your Business? Ever wonder why Investors Don't seem to "GET" your Deal? Throughout the life of your company, you will need capital to grow. Just like Champion Athletes, An Entrepreneur with Champion Potential needs a Coach. you need to Master the Art of Raising Capital. You need to Know when to Run, Pivot or Shoot! Watch this short Video and then Read On to Find Out How. Trying to raise capital for your start up business and not sure how to get started, where to go, what to do? Have you raised capital from friends and family but it just isn't enough? 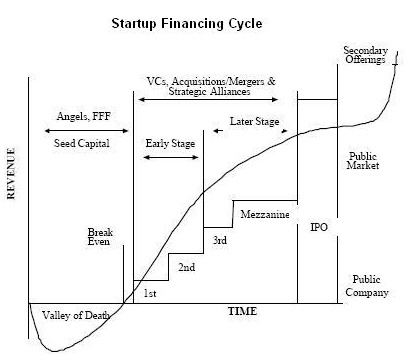 You know you need to find Angel Investors and Early Stage Venture Capital funds, but nothing seems to be working? The Entrepreneur Capital Mastery Intensive Coaching program is what you NEED! specific educational and capital readiness needs. Click here Now to go directly to the Purchase Page and Learn more about this incredible Capital Mastery Coaching Progam. Every company you see showcased in Inc Magazine, Entrepreneur Magazine, Wired and even your local business chronicle, got started by raising a seed round of capital from an "affinity group" that wanted to see them succeed. Then those successful entrepreneurs went on to raise Millions of Dollars from Business Angels. Sometimes they get even more capital from Venture Capital firms. But How? 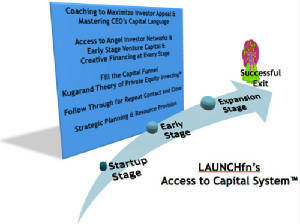 LAUNCHfn offers a Capital Mastery Course to equip entrepreneurs with the skills necessary to raise capital - at the seed stage, at their high growth stage---actually with these skills, you will be able to raise capital quickly at EVERY Stage! We will customize a program drawing from the following elements to meet your specific needs... cram packed 7 weeks of one on one coaching. We'll do a much as you are capable of completing in the given time frame. You can continue in the program for as many sessions as needed to accomplish all that you need. ¤ Initial session to determine how the program needs to be customized, timeline and task list is created, access to portal provided. Schedule is set up for 6 one hour tele-coaching sessions with a LAUNCHfn Capital Consultant. ¤ Structured coaching delivered over 6-7 sessions. You are provided access to a portal of templates, worksheets, and articles, utilized in a custom curriculum designed to meet your specific needs as an entrepreneur. Typically delivered in a weekly format, the curriculum can be compressed depending on your initial knowledge base and ability to commit the time to complete the assignments. ¤ Develop your elevator pitch and learn how to use it to attract capital at pitch events and in general networking and social settings. ¤ Get templates and help preparing your one page summary snapshot for investors, investor presentation, potential investor list, and business plan. ¤ Over come your fear of asking people you know to invest or to lead you to investors by gaining an understanding of the Psychology of raising capital. ¤ Master your capital language to give confidence to your investors so they believe you won't lose their money. ¤ Assistance in developing verbal script and messages for entrepreneur to use as they target early stage venture capital investors to "get the meeting". ¤ Already got a business plan? Then you'll receive the Business Plan Review service to ensure your business plan isn't killing your chances with investors....The valuable advice on improving the Business Plan will also be available if you are writing your business plan during the coaching program. (NOTE: if already completed the Business Plan Review then cost for this package service is reduced). ¤ Advice and counsel on offering, referral to key resources to perform work to prepare your investor documents (may be an additional cost to hire legal counsel on your offering). ¤ Specific steps for holding successful angel group meetings or conducting one on one meetings with a capital investor. ¤ Practice presentation sessions for 6 min and 10 min pitches so you accomplish the 1 thing an investor presentation is supposed to do...and it isn't what you think. ¤ Learn how to handle investor objections and how to manage your follow through process to close on the capital you seek. ¤ Deliverables are worksheets, guides, audio and information products to help entrepreneur understand what investors are looking for and mastering the "language of early stage capital raising". ¤ Cost includes a multi-week engagement with individualized coaching session and specific assignments/deliverables to equip you to raise early stage angel investor and venture capital. We'll agree on the goals of the program and work toward those objectives. ¤ At the conclusion of the coaching program, and if you stayed on task, you will have the document, attitude, knowledge, and language necessary to raise early stage capital, comfortably schedule and meet with investors, understand the follow through process, and be equipped to identify and attract the capital needed to launch and grow your business. Most Importantly You will have Confidence and the Know-How to raise the capital you need for your business. Click here to Invest in your future by purchasing this coaching package today. Two types of entrepreneurs: Startups needing a couple of hundred thousand dollars to launch their business, build a prototype, patent their product, and build a team. AND CEOs of established companies that need to raise their first round of outside capital and are not having the success they expected. Don't waste time and money spinning your wheels being ineffective at raising capital. You are sitting on a gold mind and the only thing limiting you is YOU. Learn More about pricing for this coaching package. Why Hire a Capital Coach? Most successful CEOs at some point hired a business coach to help them move to the next level. Every athlete can look back on a Coach that made the difference in their ability to master their sport. Goal oriented men and women utilize coaches to help them lose weight, overcome a mental block, and achieve success. Hiring an expert to teach you the skills you need to be comfortable and confident in raising capital for your business is the smart thing to do. Learn More and take decisive action today. "It is amazing what I didn't know I didn't know about raising capital. You have done so much for me in helping me build my advisory board, really determine my unique selling proposition in the market, and gain confidence in pitching investors. Thanks!" "I couldn't put down the Little Voice Mastery book you assigned and I had a breakthrough in my thinking that I wish I had experienced 20 years ago. I realize that I have been my own worst enemy. My product is great, my target market clearly wants it, and now I have what it takes to be the champion that I strive to be." "I needed to prepare for a large conference where I was going to be pitching investors and forming strategic alliances and I so appreciated how you accelerated the schedule so I would be prepared. Thanks...I rocked the event and my investment in your program made my investment in the conference come back to me 10-fold!" "Before participating in your capital coaching program, I was afraid to call potential investors or even to follow up with someone who had expressed an interest for fear of rejection. That was crazy to me because I have such confidence in everything else I do. You helped me identify what was causing my fear and inaction, face it and conquer it. I'd recommend this program to anyone!"